Growing up in Patterson, N.J., Edryn Gonzalez was introduced to the SMFA program by their high school art teacher, and was drawn in by its strong combination of arts and academics. 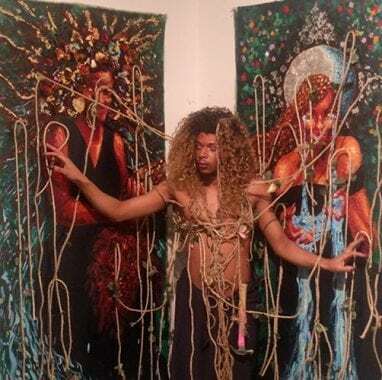 Starting out as a painter, the now rising junior focuses on performing arts and 3D installations, which much of their work relating to queer history, African diaspora, and the intersectionalities of these areas. It is important for people to feel like they have a community that they can not only help out in, but can also be supported by. In the current political and social tension, there can be this sense of a “me first, take care of yourself mentality, but I think it is important to understand the larger cultural effect of the things that you do while also supporting individualism. As an artist, sometimes it seems like if you are a minority or you identify as something different, it is expected that that is what your artwork will be about and that is the only way your art can be interesting to the world. That can be discouraging.It’s as if I am not a human first; ignoring that my personal experience adds value to the shared experience in the ways that these intersections relate to yet differ from each other. It is refreshing to work with other people of color in an art sense even on pieces that don’t relate to race or identity. It is important to reach out to other people and have this sense of community where you learn about them and gain new perspectives. While Tufts might not be that diverse in and of itself, it still creates many opportunities where it allows students to bend the rules. For example, the Critical Drag class I participated in. That was something I never thought would have existed anywhere, but somehow was able to exist at Tufts. Not everyone has the privilege or opportunity to be in a class where not only do you get to learn about queer history, but also be able to perform in drag. People really do want the space and platform to show their true selves; be part of something that challenges us and makes us grow. As an afro-latino queer person, I feel like me just living, the things that I do and the things that I try to speak about always end up being about the promotion of diversity and inclusion. By making the conscious effort to be as authentic to myself as possible, I like to think that is my way of bringing more diversity and inclusion to the community, supporting these heavy ideas of our generation, by encouraging and finding others that are authentic to themselves and their experiences, shared or personal.